Weight Loss Tracker 1.5 free download. Using a scale to determine fat weight loss is not very accurate because of changes in water weight and muscle gain, so the best way to keep track is to determine the difference in how many calories are required vs. how many are taken in. 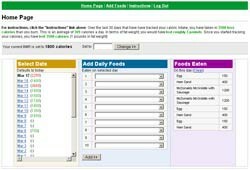 The Weight Loss Tracker is extremely easy for visitors to use, and will keep them coming back to your health-related web site.